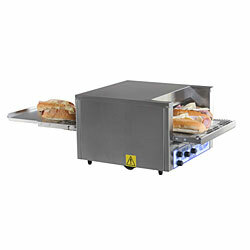 The Belleco JB3-H Conveyor Pizza Toast/Bake Oven - An electric conveyor oven with 14-1/2 inch conveyor belt and 1-1/2 to 3 inch product clearance. 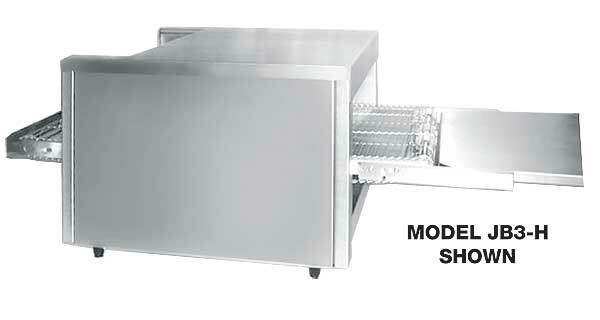 Bakes up to (31) 9 inch or (14) 12 inch par baked pizzas per hour. Featuring separate top and bottom heat controls, variable speed control, power saver switch and high temp limit switch. Stainless steel construction, cool touch exterior. 1 inch adjustable legs. ETL listed in the USA and Canada, ETL Sanitation classified to NSF 4, CE listed. Extended conveyor front and read for pass through convenience. Stainless steel exterior. Interior is 20 ga. stainless steel and 18 ga. aluminum steel. Made to order items cannot be cancelled or returned.